In the North American Versatile Hunting Dog Association (NAVHDA) tests, dogs are judged to specific standards and do not compete for placements with other dogs. NAVHDA tests evaluate versatility in the hunting dog, as many hunters hunt a wide variety of game with one dog. NAVHDA tests are conducted annually in all parts of North America. NAVHDA offers several different levels of noncompetitive gundog testing. Natural Ability Tests (NA) evaluate inherent characteristics of abilities (instincts) for dogs up to 16 months: the Utility Preparatory Test (UPT) is a mid-level test in which training and obedience are evaluated; and the Utility Test (UT) measures a dog's usefulness in all phases of hunting as a completely finished gundog. The Invitational Test measures the advanced skills of a fully trained dog of championship caliber and is only available to those dogs recieving a a Prize 1 in a Utility test. 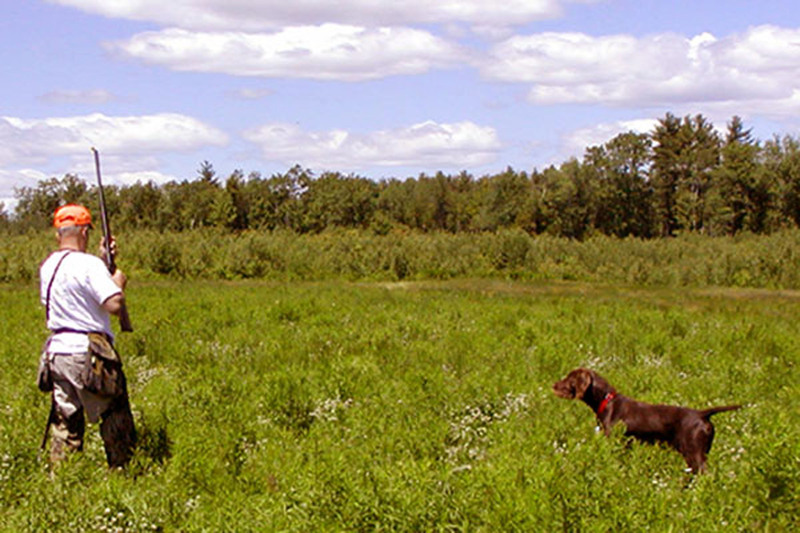 The versatile dog is expected to work both upland game and waterfowl at all levels of testing. During field work, dogs are evaluated on pointing, standing steady to wing,shot and fall, retrieving upon command, and tracking. During water work, dogs are evaluated on steadiness, marking ability, locating, and retrieving game in typical duck hunting situations. Dogs are given a total score for their work in Natural Ability and Utility. A perfect score in Natural Ability is 112 points. A perfect score in Utility is 204 points. Dogs also receive a Prize I, Prize II, or Prize III only if they qualify. Dogs not qualifying receive no prize. Be sure to evaluate the dogs that we are breeding at Cedarwood Kennels on our "Breeding Stock" page and notice the pedigrees of our dogs have primarily all NAVHDA Prize I Natural Ability titles in their backgrounds. It has taken years of dedication to develope pedigrees with this much concentration of Prize I performers and only dogs of this caliber can produce dogs expected to match the demands of todays sportsmen. In Tom Goodings evaluation of the pudelpointer's Natural Ability and Utility prospectus, never did parents that recieved <105 points in natural ability produce litters that averaged >100 points in Natural Ability testing. Only those parents which recieved >105 points in Natural Ability were able to produce litters with a Natural Ability average >100 points. It is from this 30 year study that we selected 105 points as a minimum score for our breeding stock. Milan Novak's studies show a straight line regression curve, also supporting our conclusions and use of this breeding standard. Just testing dogs in NAVHDA isnt enough to maintain a concrete breeding program and any breeder taking this approach isnt paying due respect to this wonderful breed as there must be a standard in place that supports a mission statement. Since all dogs at Cedarwood Kennels are NAVHDA tested we strongly believe in the NAVHDA breeding approach. The NAVHDA system is based on a testing system under which many of the versatile breeds are maintained; one which in rooted in the science of animal breeding and selection. Under this evaluation system, Cedarwood Pudelpointers have maintained their versatile qualities which they have proved on Idaho's upland gamebirds and waterfowl. We put a strong emphasis on a dogs ability to work wild birds before any breeding determinations are made. Our dogs are requested by the hunting community, seeking the best available versatile gun dog they can own, which will also charm their family as a permanent family member. After having over 300 dogs tested in NAVHDA's Natural Ability Test across North America, our Cedarwood Pudelpointers have earned an average(mean) score of 104 points over the past 25 years; earning our kennel >20 NAVHDA Breeders Awards. The improvements made by our breeding standard are obvious as the last 150 dogs tested during the last 10 years have earned an average (mean) score of 108 points. We have,also, trained and tested 49 dogs at the NAVHDA Utility level; prizing all 49 dogs with 15 recieving a UT Prize I. Very few breeders have trained/handled more than one or two dogs in their lives at the Utility level; let alone 49. There currently are 7 Versatile Champion pudelpointers in North America and 5 dogs were produced by Cedarwood stud dogs, which clearly supports the prominance seen in our strain at Cedarwood Kennels. For a breeder the NAVHDA Natural Ability test is the best forecaster of breeding potential. Utility testing demonstrates the top end desire a dog has in the water at the duck search portion of the test, but suggests only about a 50/50 split between the trainers commitment and the dog's inherant abilities. At the NAVHDA Invitational testing the trainer's commitment is at a much higher percentage of the obseved outcome yet. After 25 plus years of raising pudelpointers, Cedarwood Kennels has had >300 pudelpointers run in NAVHDA Natural Ability tests across North America. The average score of those >300 dogs tested is 104 points out of a maximum perfect score of 112 points. What is interesting is that Cedarwood put a breeding standard in place about 10 years ago where onLY dogs earning 105 points in Natural Ability or better could be used for breeding purposes. In addition, all males must have earned a NAVHDA Utility Prize.. Since raising this standard the average Natural Ability score for Cedarwood dogs tested over the past 10 years has raised from 104 point average to a 108 point average. Cedarwoods First Offense (aka Tukr) was our first true producing star as a stud dog. His prepotent ability to produce was soon apparent when 80% of his offspring earned a Prize I in Natural Abil;ity testing. Tukr came into our breeding rotation about 13 years ago, so the improved average Natural Ability score from 104 to 108 points was surely influemced by his breeding potential and prepotent status. Close examination of Tukr's pedigree, however, tells the tail; 29 out of 30 dogs on his pedigree have earned a Prize I in NAVHDA Natural Ability testing. Cedarwoods next prepotent stud dog is Hidden Acres Atlas (aka Romo). His pedigree expands Cedarwoods Quick Release and Hery Ze Strazistskych Lesu genetics through 4 generations. Trained and handled in NAVHDA testing to a 108 Natural Ability score and a 204 Utility score by my 10 year old grandson Hunter Farris showcases this dog's field and water prowess and cooperative trainability. Lord Ze Strazistskych Lesu (aka Czar) is our latest Czech Republic import and he is giving our kennel the "nick" we recieved some years ago from Hery Ze Strazistskych Lesu. Never have we seen a more accomplished field dog than Czar and his NAVHDA test scores and progeny report certainly supports this. During the past 25 years of breeding pudelpointers there have been Cedarwood pudelpointers tested in NAVHDA Utility tests across all parts of North America. Of these >100 dogs tested 49 have been trained and tested by Bob Farris and used to create the Cedarwood line of pudelpointers one sees today. These are the performance statistics a concerned puppy shopper should be focusing on. Afterall, we all know the horsepower, fuel economy, and pulling power of that new pickup before purchasing, so why not have performance expectations before purchasing that next hunting companion, regardless of breed chosen. There are many other NAVHDA breeders with other versatile breeds that use NAVHDA as a breeding tool. It is with great pride that we boast especially of the past 10 years of NAVHDA testing: >150 pudelpointers from our Cedarwood Kennel were tested in NAVHDA Natural Ability tests with an average score of 108 points for those >150 dogs. >60% of these 150 dogs tested recieved a Prize I. For anyone understanding NAVHDA testing and able to evaluate testing data, our breeding program is clearly at the cutting edge of excellance and these results support it. We have also won First Place trophies in National Shoot to Retrieve (NSTRA field trials) with 4 different Cedarwood stud dogs. Only Cedarwood dogs have ever won NSTRA field trials. We are finding the NSTRA field trials to be an excellent way to evaluate our breeding stock in a head to head competion with the best from the other major pointing breeds. These NSTRA accomplishments are what we feel gives our kennel a higher level of merit, when compared to any other kennel in North America producing versatile gundogs; as we have merely raised the bar of excellence at our kennel to a significantly higher level. VC Cedarwoods Man O War (a NAVHDA Versatile Champion) is the only NSTRA Champion pudelpointer competing against all the top pointing breeds. He is also a HC Champion (Hunting Retriver), earning this title while competing with labs and other retrievers. Our current stud dogs have also produced remarkable NAVHDA statistics, but Cedarwoods First Offense (aka Tukr) certainly leads all pudelpointer sires. He has had 90 progeny tested in NAVHDA Natural Ability tests with an average score of 108 points for those 90 plus dogs. Currently, he has sired 8 Versatile Champions. Tukr has been instrumental in the success of 5 other Pudelpointer Kennels as we have allowed some his sevices as a stud dog. Examination of his pedigree shows 29 out of 30 dogs in his background to be NAVHDA Natural Ability Prize I performers making it obvious as to his potency as the breed's top producer. The above evaluating summation should help you make a sounder decision when seeking your new hunting companion. Remember to ask breeders to supply you with data supporting their breeding decisions and make it be in the form of test scores, not their own personal evaluation. Available data on the parents, grandparents, and great grandparents test scores should be a must for those seeking a top versatile hunting dog regardless of the breed selected. 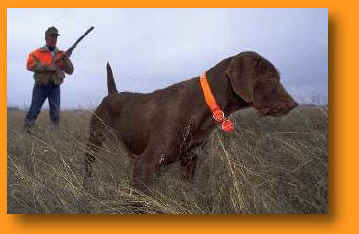 If your seeking a hunting dog, look only at breeders that hunt wild birds. Some kennel's expectations are very limited and this will invariably show up in their breeding stock's NAVHDA test scores. It is still amazing, with all the infromation available for today's sportsmen, how many neglect to research their next hunting companion and merely assume all dogs from the same breed are alike, especially when it's to be a 12-14 year commitment. Anyone seeking a new dog should also expect to recieve a favorable guarantee with many references that are current and several should be NAVHDA judges that are familiar with all the available kennel's dogs. One of the best pieces of advice I've ever heard given was from an elder dog enthusiast with years of experience behind gundogs. He said: "potential dog owners need to pick 3 things, rather than just a puppy. First, pick the breed best suited for your individual needs. Second, pick the breeder producing what you expect to own. Third, pick a puppy with your breeder that seems to fit your needs the most (your breeder sees the pups every day whereas the buyer only sees the pups for short periods). Remember, if you plan to hunt wild birds pick a breeder that also hunts wild birds and has extremelly high expectations from their personal dogs in the field. Dont just rely on testing results when looking for that next hunting companion.